During my time there, I've learned my worth as not only a musician but an artist. I'm glad to say that I made the right choice to choose to live the CSSSA experience before I start college. 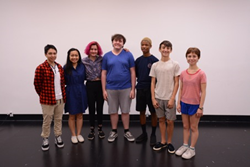 The Herb Alpert Foundation and the California State Summer School for the Arts (CSSSA) are pleased to announce the 2018 recipients of the annual Herb Alpert Scholarships for Emerging Young Artists (EYA Awards). The Herb Alpert Foundation annually provides 21 scholarships for CSSSA students in seven disciplines: animation, creative writing, dance, film, music, theatre and visual arts. This visionary, long-term support from The Herb Alpert Foundation has provided over $3 million in college scholarship funding to date, fostering the creative spirit of these talented youth, and empowering them to grow and become vital members of their community. The top-performing student in each arts discipline is awarded $40,000 over the course of four years to complete university-level study. Additional one-time awards of $2,500 are awarded to two high-achieving students from each of the seven disciplines. This comprises a grand total of $340,800 in scholarships awarded to CSSSA students for 2018 alone. Beyond the commitment to the college scholarships, The Herb Alpert Foundation also provides an annual gift of $40,000 to CSSSA to support low-income, financial need scholarships. Established as a unique public-private partnership, the CSSSA Foundation works alongside CSSSA to ensure that no qualified student is denied access to CSSSA due to financial hardship. By opening the doors for youth through generous partners like the Herb Alpert Foundation, access and opportunity are provided for students that would otherwise not have the opportunity to attend the powerful and transformative CSSSA summer program. Once at CSSSA, they gain the possibility of being awarded one of these prestigious, life-changing college scholarships. CSSSA is a four-week, intensive pre-college program for talented and motivated high school students in the arts, held on the California Institute of the Arts (CalArts) campus in Valencia. CSSSA has an annual student body of over 500 young artists from California and an additional 20 students admitted from other states and countries. Approximately 40% of students receive financial aid to attend the summer arts program each year. CSSSA offers a unique opportunity for students to spend one month immersed in a creative laboratory experiencing the inspiring and rigorous daily life of a professional artist. Applications will be available for CSSSA Summer 2019 beginning December 2018 at http://www.csssa.org. To learn more about the Herb Alpert Scholarship for Emerging Young Artists, our alumni program, or to donate, visit csssaf.org.